Kevin Ahearne says "Why use rice when we can use an Irish product that's high in protein, fibre & b vitamins? Tastes just as good if not better & Its available in any good supermarket." Kevin Aheanre says "Why use rice when we can use an Irish product that’s high in protein, fibre & b vitamins? Tastes just as good if not better & Its available in any good supermarket." 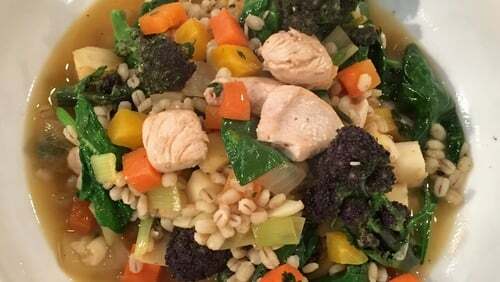 In this recipe, I’m using hulled barley. Basically, it’s the barley with the outer shell off but with the inner layer still attached. If it has the inner layer removed its known as pearl barley. The reason I’m using the hulled barley is that the outer layer is where the source of fibre comes from. This is a healthy, hearty, & affordable dish that can be adapted to suit vegetarian or vegan needs! The only downside with this recipe is that it has to be planned ahead as the barley needs to be soaked overnight in cold water. Once soaked run under cold water to wash off the starch. Strain and set aside until needed. In a large based pot on a medium to high heat fry the chicken pieces in the oil & butter until golden brown. Turn the heat down to medium. Add the vegetables, garlic & herbs excluding the parsley & spinach. Cook for 3 minutes. Add the white wine. Reduce by half. Now add the barley. Add the stock or water which should just about cover the barley. Bring to the boil & simmer for 12 minutes. Switch off the heat cover the pot and leave to stand for 5 minutes. Add the parsley & spinach and stir. Season with salt & pepper to taste. The Barsotto (Barley risotto) should be the consistency that if falls off the end of a spoon. Serve equal quantities in 4 warm bowls. Grate some cheddar over the top and enjoy!